What is global dexterity and why does it matter? Global dexterity is the ability to successfully adapt your behavior in a foreign culture without losing yourself in the process. It’s about “fitting in” without “giving in” – learning to adapt your behavior to the new cultural rules, but doing so in a way that’s within your own personal comfort zone. Why does it matter? In today’s global economy we’re constantly in situations where we need to change how we act to be effective at our jobs. This is true when giving or receiving performance feedback; when asserting our voice in a meeting; when conducting a performance review, delivering bad news, motivating and leading others, forging relationships through “small talk” and the list goes on and on. All these situations vary across cultures and to be effective at your job, you need to learn how to do them well in the culture you’re working in. But that’s only half the battle because in many cases the way that you need to act to be effective conflicts with what’s natural and comfortable for you. And that’s the real challenge of developing global dexterity: learning to adapt but not feeling like you’re losing yourself in the process. What are some common challenges to cultural adaptation? The first challenge is learning the new cultural rules – and that’s the most obvious one. But, learning the rules is only half the battle. Once you’ve learned the rules, the next challenge is to put this knowledge into action. And that’s the real challenge of global dexterity: to act according to the cultural differences you’ve learned about, because it can often feel quite unnatural and uncomfortable to do so. You can feel anxious and embarrassed about not having quite mastered the rules, uncomfortable about behaving in a way that’s so foreign and unnatural, and also even frustrated or angry about having to adapt in the first place. And these emotional reactions to switching cultural behavior can weigh heavily on you – and interfere — as you attempt to adapt your behavior. How can you develop your own global dexterity? Let’s use an acting analogy. Step 1 is learning your lines – or the set of expectations for how you need to behave in a particular foreign cultural situation to be effective – whether it’s giving or receiving feedback, participating at a meeting, or pitching yourself to an investor. Step 2 is rehearsal: trying out the new behavior and see how it feels and fits – feels to you, in terms of whether it feels comfortable enough to do and fits, in terms of whether it’s effective in the new setting. If it doesn’t fit completely, you can adjust, tweak, or what I call “customize” an individualized approach to the new behavior; something that fits in their culture and also feels comfortable enough for you to perform. That’s where a coach or mentor comes in as well – someone who can help you adjust your behavior and cope with any challenges you experience. Finally, Step 3 is dress rehearsal and then performance. Practice in realistic situations similar to the important “target” situation you’re aiming for (e.g., performance feedback to a top exec), but perhaps with a bit less pressure (e.g., performance feedback to a low level employee). Follow this process, and you can develop global dexterity and stay true to who you are. 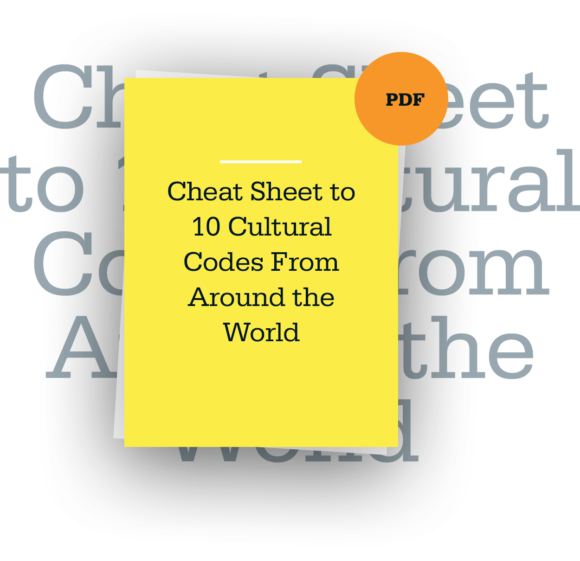 The cultural code is like a script – a set of rules to follow in order to act effectively in a given situation in a new setting. For example, when making a point in a business meeting in, say, Germany, how directly are you expected to communicate? How assertively can you express your opinion? With how much enthusiasm or expression of emotion are you expected to speak. That’s the code and learning it is a crucial part of developing global dexterity. How do you chart success over time? Two ways: internally and externally. Let’s say you’re a Chinese-born manager in the US working on how to assert yourself with superiors during brainstorming discussions at the firm. External progress is how well your native-born manager, supervisor and colleagues judge your performance. Internal progress is how comfortable and natural you feel inside, which is also important because it can “leak” into your behavior and undermine your effectiveness. In a one-off situation, you can just probably suppress this discomfort, but over the long haul, that doesn’t typically work. I offer tools for assessing both internal and external performance in my book. What are some key takeaways to remember? Let’s talk about two. The first has to do with what’s most critical to teach employees about diversity and crossing cultures. The conventional wisdom is that it’s differences: to be effective across cultures, you need to learn about cultural differences. That’s certainly true, but it’s only half of the puzzle. To be truly effective across cultures, knowledge of differences isn’t enough. You need to be able to adapt or shift your behavior in light of these differences – and that’s what I mean by global dexterity. The second key take-away is that culture is less fixed and more malleable than you probably thought. Many people think that adapting behavior in a new culture is like hitting the center bull’s-eye of an archery target. But in my experience, that’s simply not true. You do have leeway to adjust, and by doing this smartly (and with the steps and processes outlined in my book! ), you can achieve success without compromising your authenticity. No one likes to move beyond his or her comfort zone, but that’s really where the magic happens.